Opal, 3.51 cts, 1.3 x 1.2 x 0.5 cm, cut by Spectrum Award-winning faceter Mark Kaufman. Tsehay Mewcha, Wegeltena, Delanta Woreda, South Welo, Amhara Region, Ethiopia. © Rob Lavinsky, www.iRocks.com. Used with permission. Evaluating precious opal is a highly refined art. For details, see our articles on Appraising Opals and our Opal Buying Guide. 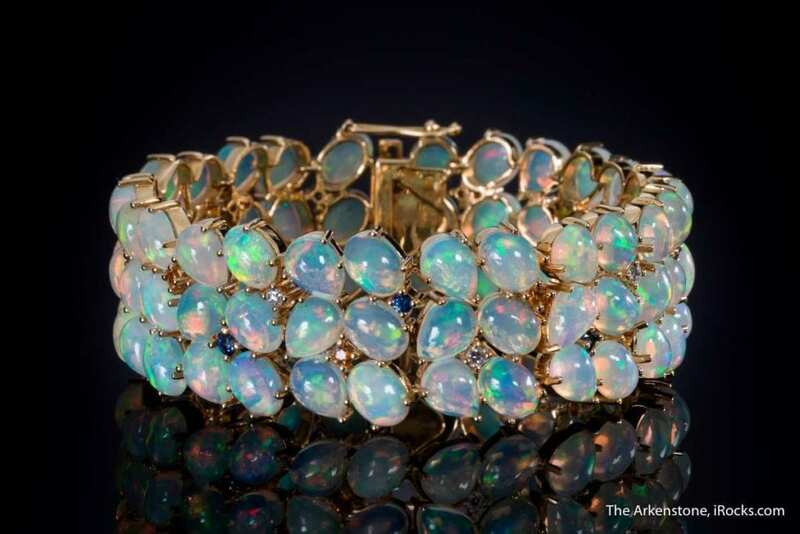 78 opal cabochons (52 ctw) in 18k gold bracelet, Welo, Ethiopia. © Rob Lavinsky, www.iRocks.com. Used with permission. Composite Opals Doublets prices are usually 15% to 35% of the value of similar looking natural, (solid,) gem. However, they occasionally run as high as 50% of a natural opal if they are of exceptional quality. Triplets are only about 1% of the value of an equivalent natural and peak at . Colors Colorless, white, yellow, orange, and red (various shades), yellowish brown, greenish, blue, gray, black, violet. Crystallography Amorphous. Recent work shows that opal is composed of an aggregate of tiny spherical particles, that is, a solidified gel; often forms concretions; botryoidal; reniform; stalactitic. Specific Gravity 1.99-2.25. 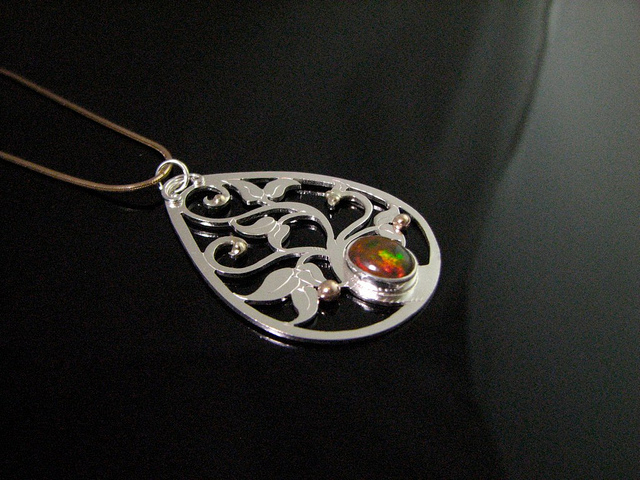 (Orange-red variety, ~2.00; black and white opal, 2.10; green opal, 2.12). Special Care Instructions Very heat senstive, clean with warm or room temperature soap and water. Avoid wearing gem where it will get rough treatment. Absorption Spectrum Most none. Green line at 660 nm, cutoff at 470 nm. Phenomena Play of Color. Asterism, chatoyancy, both rare. SiO2 · nH2O. Water= 1-21% in opal, usually 6-10% in precious opal. Isotropic; N: 1.44-1.47. Mexican opal as low as 1.37, usually 1.42-1.43. In sedimentary rocks or where low temperature solutions bearing silica can percolate through rocks. Nature scenes and animals were popular motifs in Art Nouveau jewelry, and opals were popular gemstones during this period. 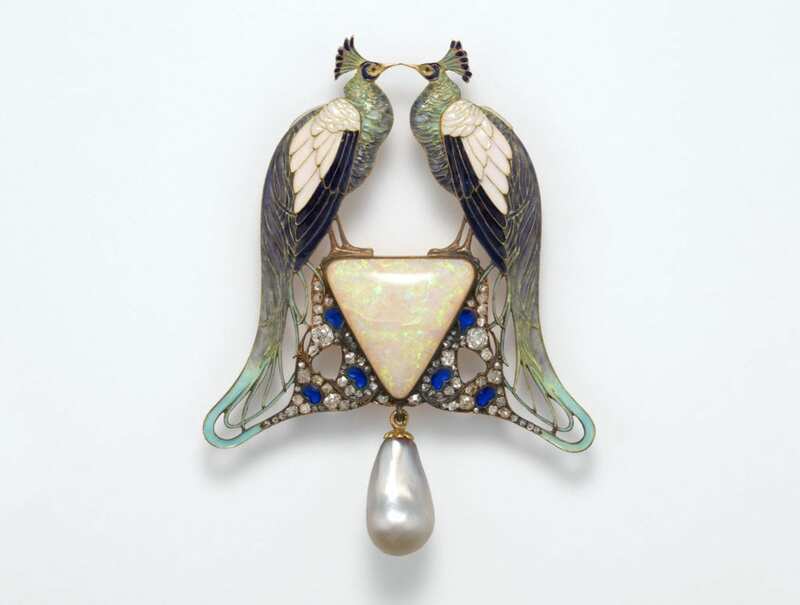 In this pendant by René-Jules Lalique, two enamel peacocks stand on a triangular opal cabochon. Gold, enamel, opal, pearl, and diamonds, 7.6 x 6 cm. France, circa 1901. Gift of Clare Le Corbeiller, 1991. Metropolitan Museum of Art, New York. Public Domain. (Cropped to show detail). For thousands of years, people have mined and treasured opals. These striking gems have inspired a rich body of folklore. (So rich, in fact, opal gems have been considered both the luckiest and unluckiest stones you can wear). Nevertheless, some scholars believe many ancient references to opal may actually have been to other gems, such as the iridescent iris agate. Black opal, Australia (stone in bracelet ~ 20 carats). Photo © Joel E. Arem, PhD, FGA. Used with permission. Opal is an amorphous form of silica, chemically similar to quartz, but containing 3% to 21% water within its mineral structure. 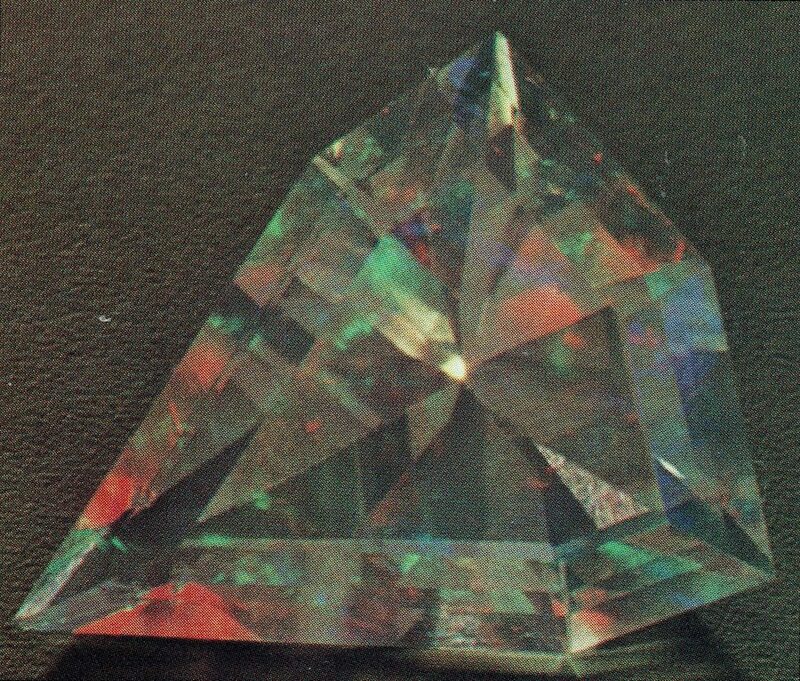 Gem grade opals usually have 6% to 10% water content. Opal is a sedimentary stone. Under the proper conditions, water percolates through the earth, becoming rich in dissolved silicates. When water enters a cavity, it deposits the silicates as microscopic spheres, forming opals. If the spheres are uniform in size and shape and neatly stacked, they will diffract light. 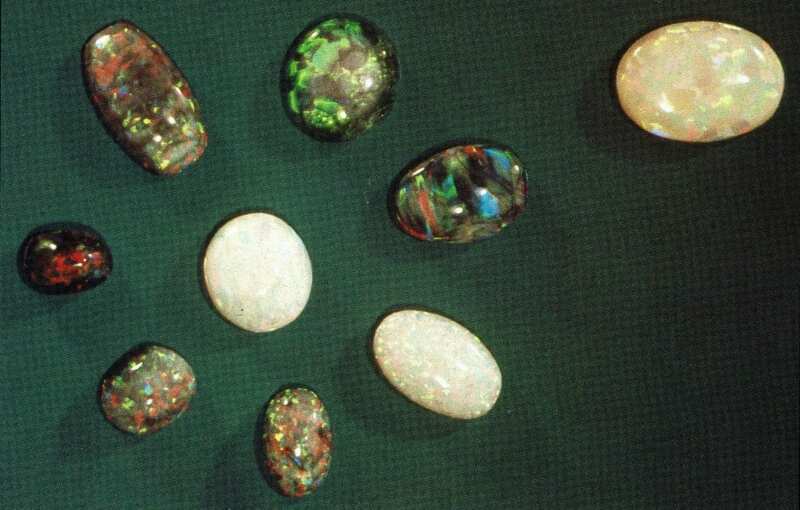 These stones are called precious opals. If the spheres are random in size, shape, and arrangement, the results are common opals. 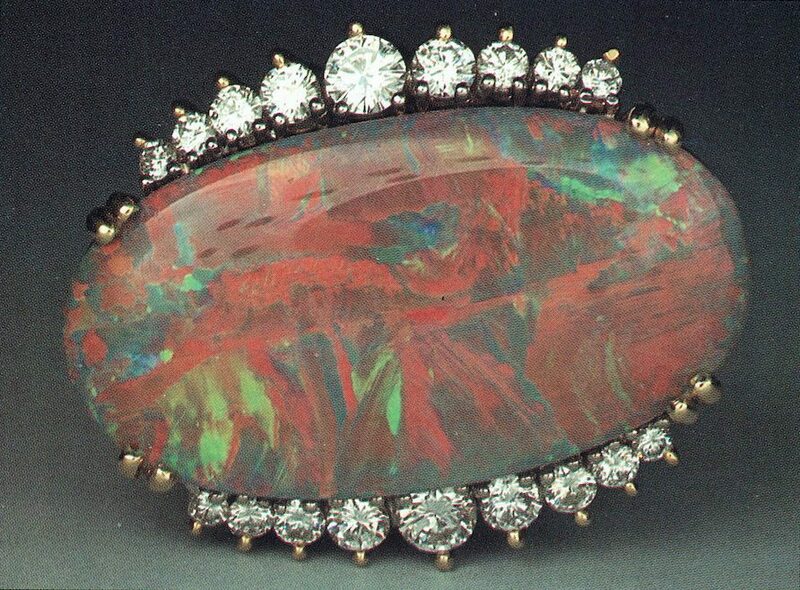 Opal’s characteristic fire, or play of colors, was long thought to be the result of iridescence. However, with the advent of scanning electron microscopes, we now know it’s a result of diffraction. 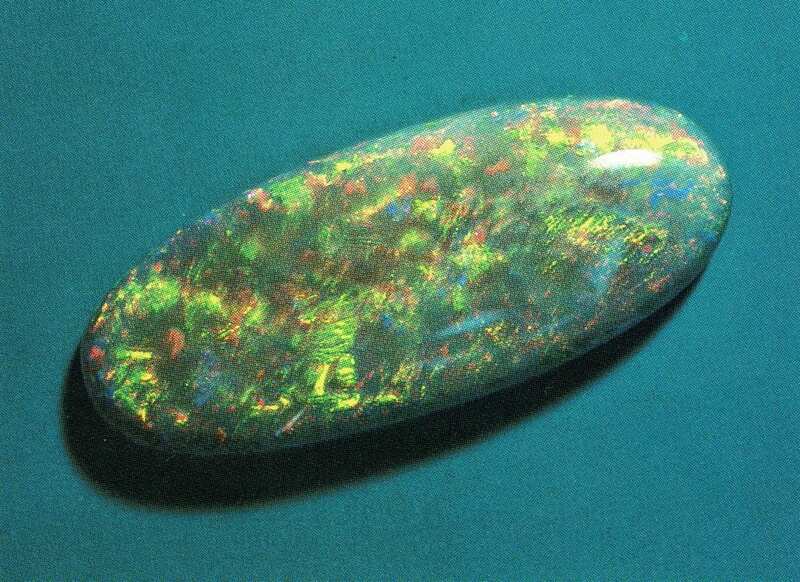 This phenomenon of flashing or moving colors due to diffraction isn’t related to the body color of the opal. 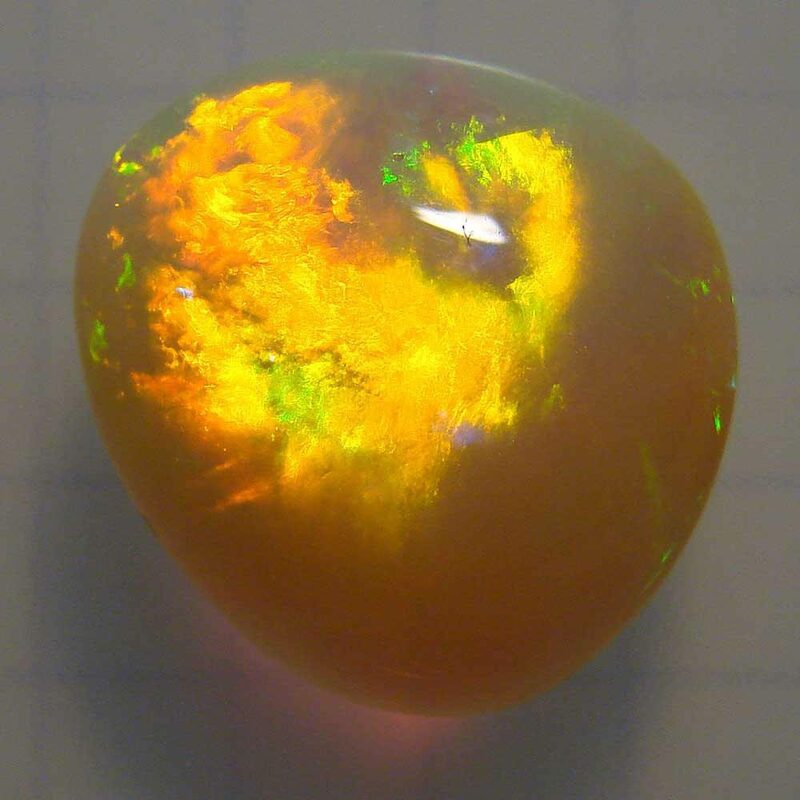 The particular colors seen in an opal’s fire depend on the size of the spheres and the angle of viewing. 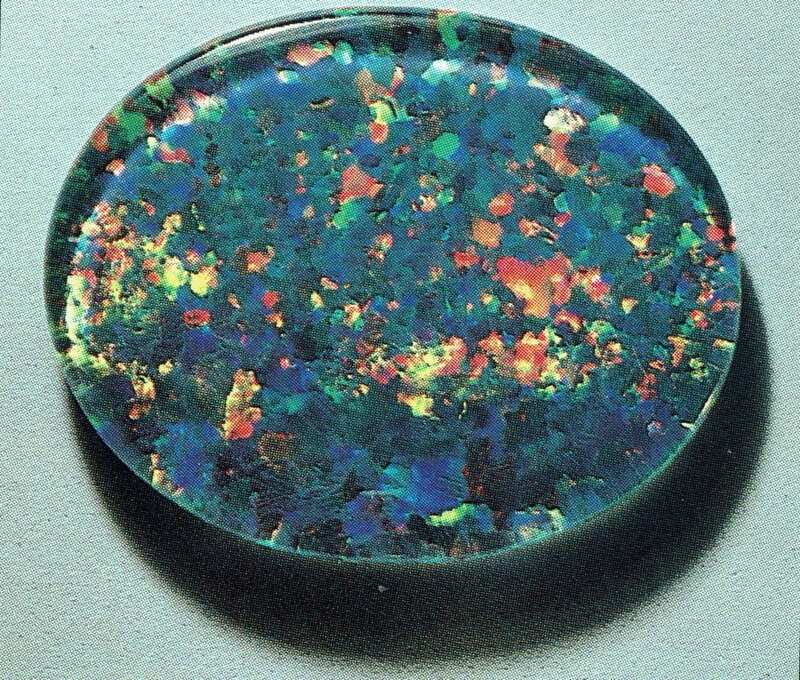 For example, black opal gets its color from volcanic ash, but inclusions have nothing to do with the play of color. That is due entirely to the tiny silicate spheres. They must be smaller than 1,500 angstroms (Å) for blue and violet colors, but no larger than 3,500 Å to produce oranges and reds. To put that in perspective, 20,000 spheres are about the size of the period at the end of this sentence. (An angstrom is one ten-billionth of a meter). Opal ring. Photo by Gyulfox. Public Domain. 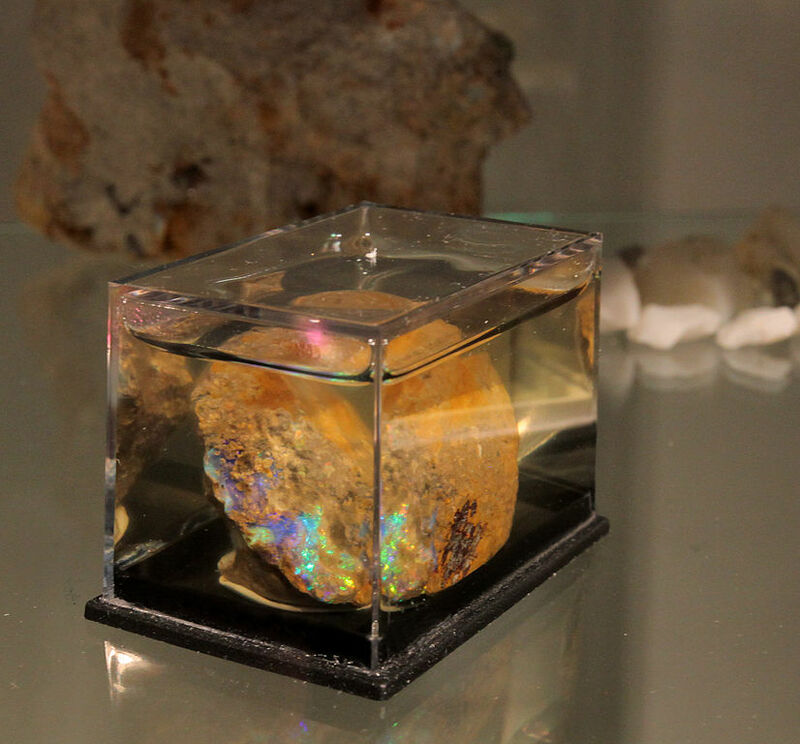 Since opals grow by filling in cavities in the earth, sometimes they take the shapes of pieces of wood, bone, and seashells buried in the ground. In effect, opal replaces these organic materials. These opals are called pseudomorphs, materials with shapes unrelated to their chemical content. Opalized wood is also called xylopal or zeasite. 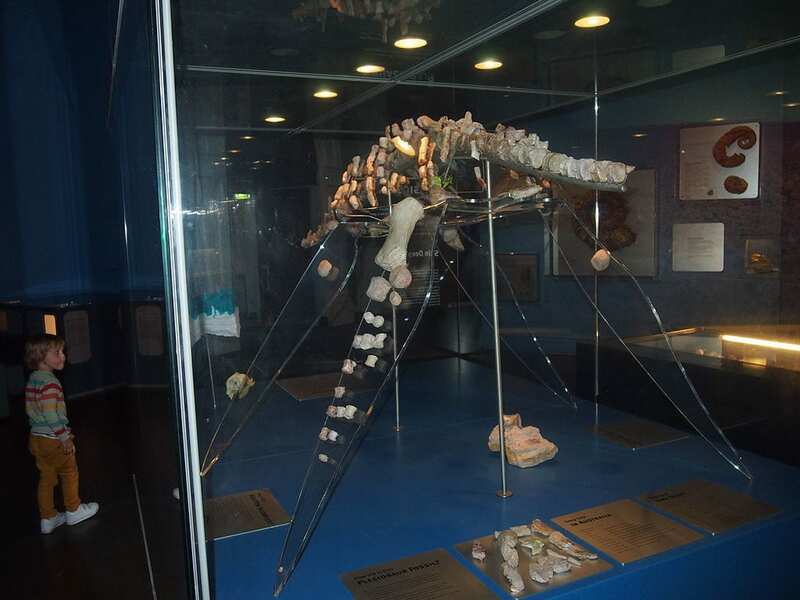 Rear view of the opalized Addyman fossilized plesiosaur at the South Australian Museum. Photo by Bahudhara. Licensed under CC By-SA 3.0. Gem cutters can take opal pieces too thin to use as a solid gemstones and assemble them into doublets and triplets. A doublet consists of a thin layer of precious opal glued to a black base. A triplet adds a transparent, quartz cap. Triplets make good ring stones because the hard quartz keeps the softer opal from scratching. 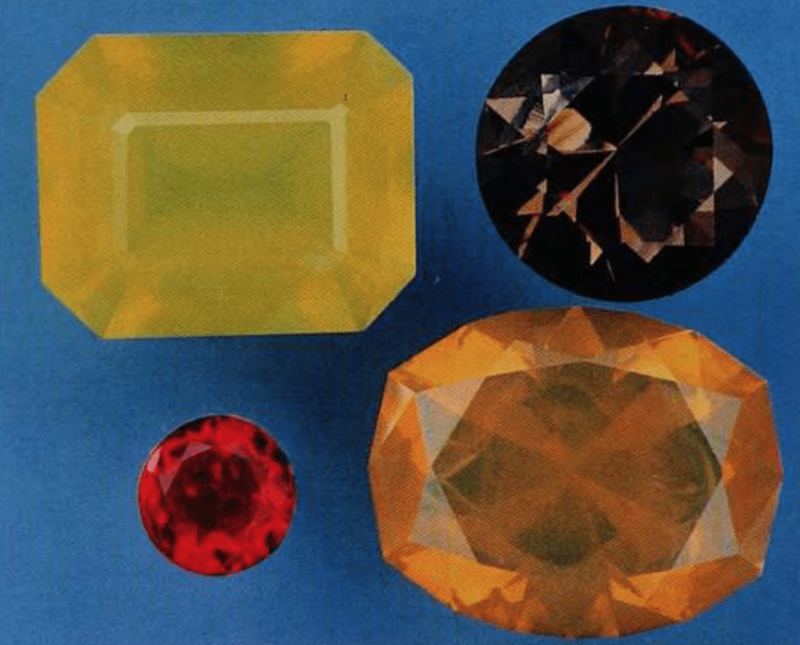 While purists prefer common opal for the base material, jewelers use many black materials, including old phonograph records. Opal triplet: Australian rough, ceramic base, and quartz top (30 x 23 mm). Photo © Joel E. Arem, PhD, FGA. Used with permission. The term “common opal” refers to opaque or glassy opals with a waxy luster. Seldom cut, these stones come in a wide range of colors. 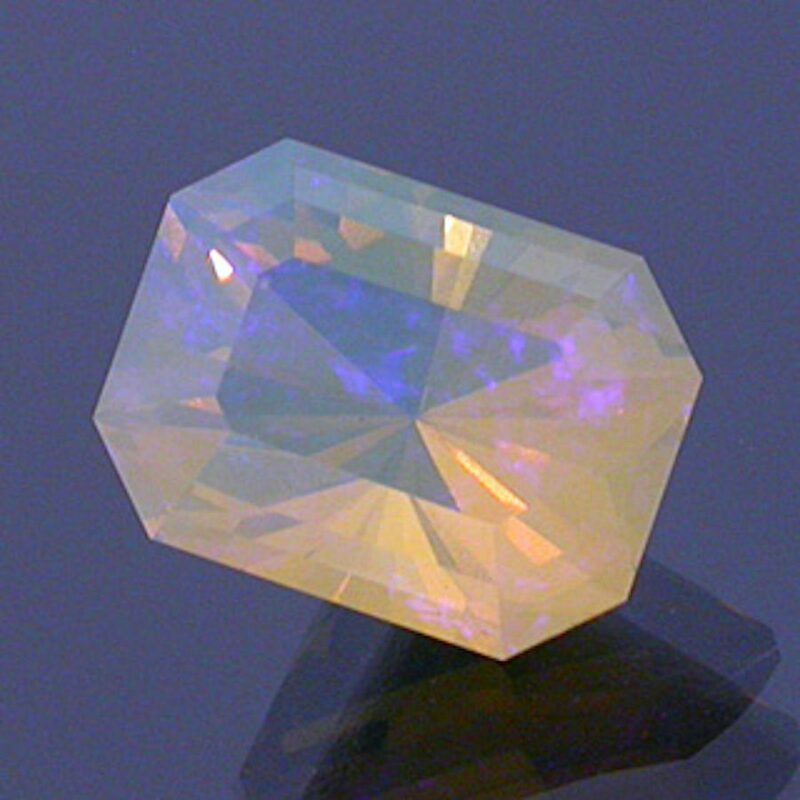 Common opals are often fluorescent. The terms “precious opal” as well as “noble opal” refer to opals of any color that display fire or a play of colors. Black opals have a black body color with fire, which is often spectacular against a dark background. Body colors can also be very dark bluish, greenish, or brownish. Please note that the term “black opal” may also refer to black potch (inferior opal material) covered with a thin layer of crystal opal, which lets the black show through later. 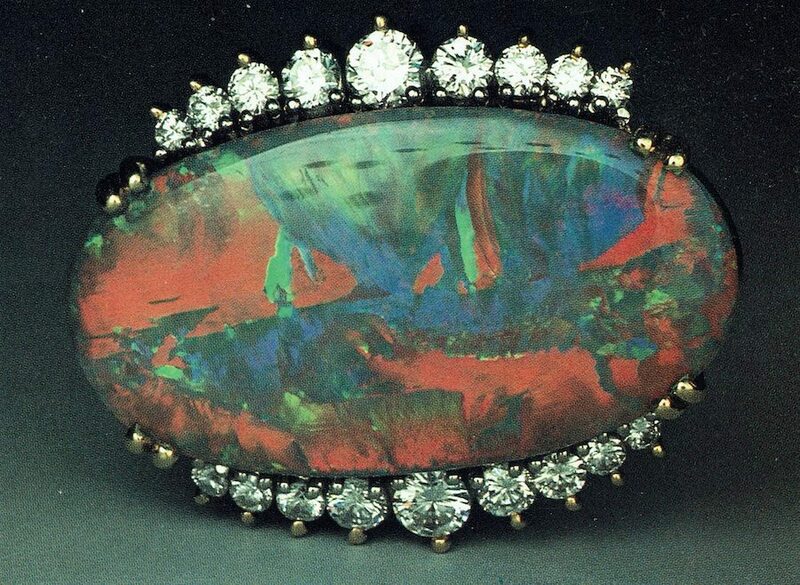 A black opal from Australia, illuminated from two positions. 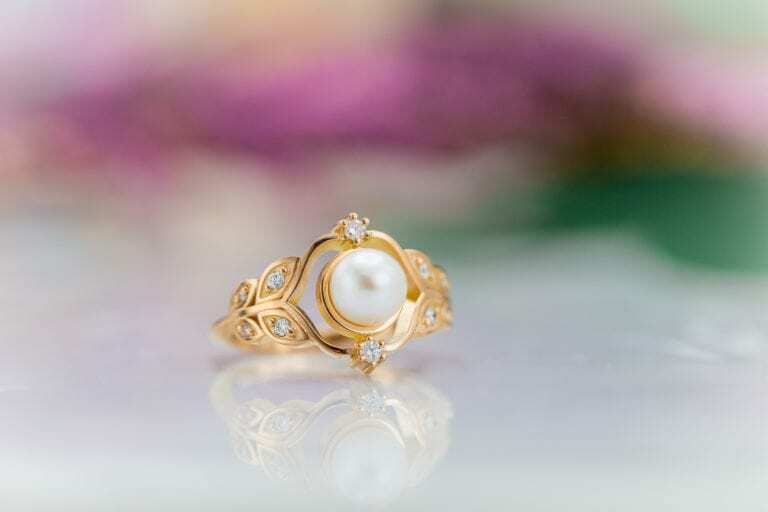 (Stone in ring approximately 10 cts). Photo © Joel E. Arem, PhD, FGA. Used with permission. Gray or semi-black opal has light to dark body color with fire. Semi-black opal: Australia (approximately 10 cts). Photo © Joel E. Arem, PhD, FGA. Used with permission. White body color with fire. A transparent or colorless body that may have fire in it. Colorless and transparent to semi-transparent in transmitted light, crystal opals have a rich play of colors in reflected light. Black crystal opals are transparent to semi-transparent with dark body color and play of color. 14k gold pendant with 31-ct crystal opal. Photo by Dan Mekis, Red Carpet Opals. Licensed under CC By-SA 3.0. These translucent, milk white stones may also have yellowish or greenish color. Translucent to transparent with a yellow, orange, or red body color, these stones may or may not display a play of colors. The “fire” in their name refers to their body color, not to play of color. These stones are also called Mexican or sun opals. 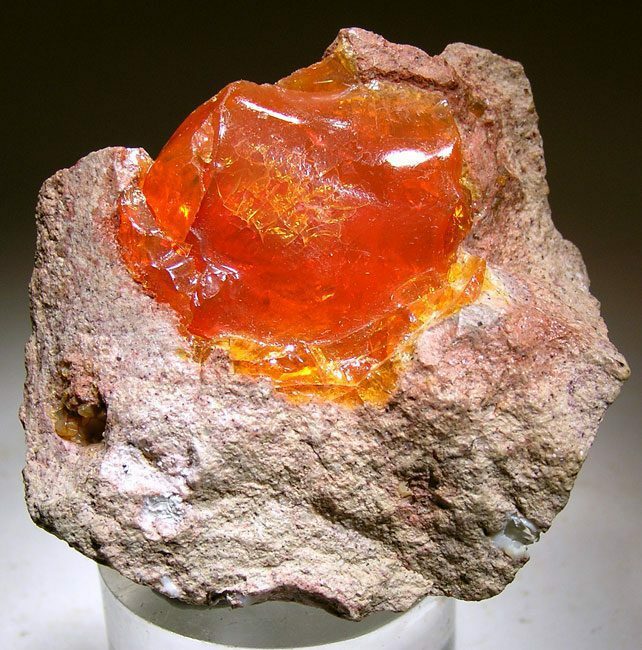 Fire opal, Idaho (11.74), Mexico (5.15, hyalite)// Mexico (0.76, 8.04). Photo © Joel E. Arem, PhD, FGA. Used with permission. Thin seams of opal that form in ironstone, these gems come in many colors and show dazzling fire, backed by their brown ironstone matrix. Layered boulder opal, about 3 cm in width. Photo by Dietmar Down Under. Licensed under CC By 2.0. Very rare, contraluz opals are usually found in Mexico but have also been found in Australia. These transparent opals show a play of color in both transmitted and reflected light. 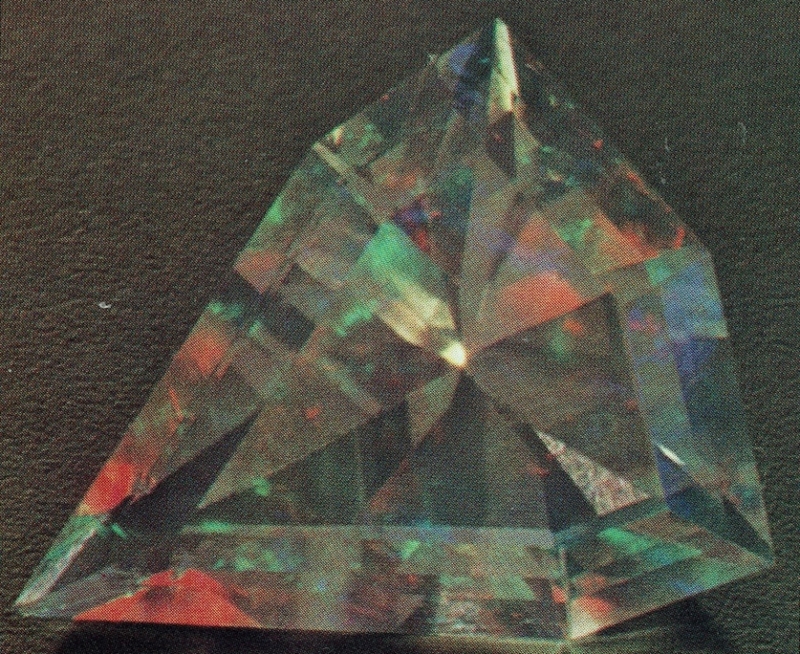 A contraluz opal from Mexico, illuminated from front and back (approximately 4 cts). Photo © Joel E. Arem, PhD, FGA. Used with permission. Hyalites or jelly opals are transparent to translucent, colorless or white to gray opals with glassy luster. With little to no play of color, they’re rarely faceted and generally have no gem significance. Hyalite opal, 15 mm, Bohouskovice near Kremze, Czech Republic. Photo by Xth-Floor. Licensed under CC By-SA 3.0. White to brownish and opaque, moss opals contain dendritic inclusions that resemble moss. Moss opal, Idaho (5.70). Photo © Joel E. Arem, PhD, FGA. Used with permission. Siliceous sinter or geyserite is glassy opal that forms around hot springs and geysers. These massive formations aren’t faceted for jewelry. Geyserite, Iceland (9 x 5.5cm). Photo by Didier Descouens. Licensed under CC By-SA 4.0. 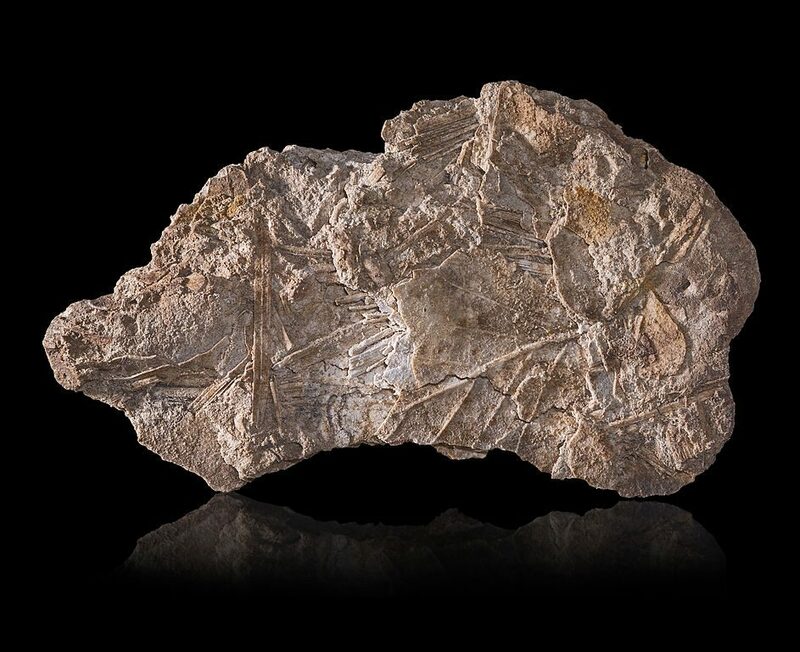 Tripoli or diatomaceous earth consists of fine-grained, powdery masses of opal or the siliceous remains of microscopic marine animals called diatoms. This material is often used in polishing agents and fillers. Often bluish white, translucent to opaque, and very porous, cacholong opals resemble porcelain. This stone, also called kalmuck agate opal, will actually stick to your tongue. These reddish brown and opaque opals resemble jaspers. 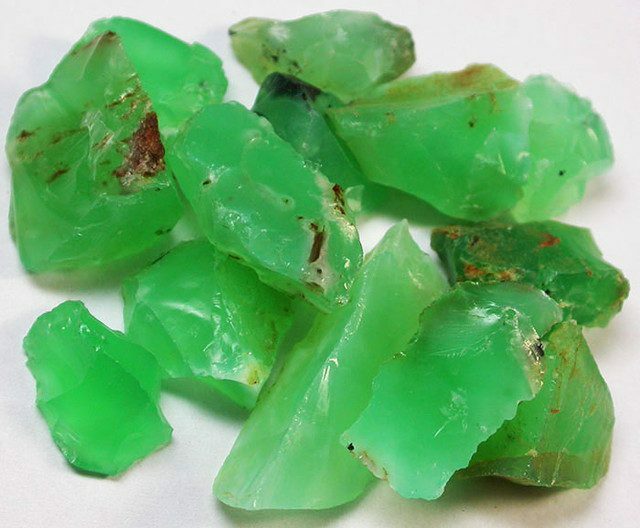 These green to yellowish green, translucent to opaque, common opals resemble chrysoprase. Chrysopal refers to a golden green variety. Prase opals. Photo by Aisha Brown. Licensed under CC By-SA 2.0. An opaque gray to brown opal with a concretionary structure. Menilite, 9 x 6.8 x 4 mm, Plateau de Merdogne, Puy-de-Dôme, Auvergne France. Photo by Didier Descouens. Licensed under CC By-SA 4.0. An opaline (opal-like) silica found in the joints of some bamboo. Semi-transparent to translucent with a moving, billowy light effect, girasol opals resemble moonstones. 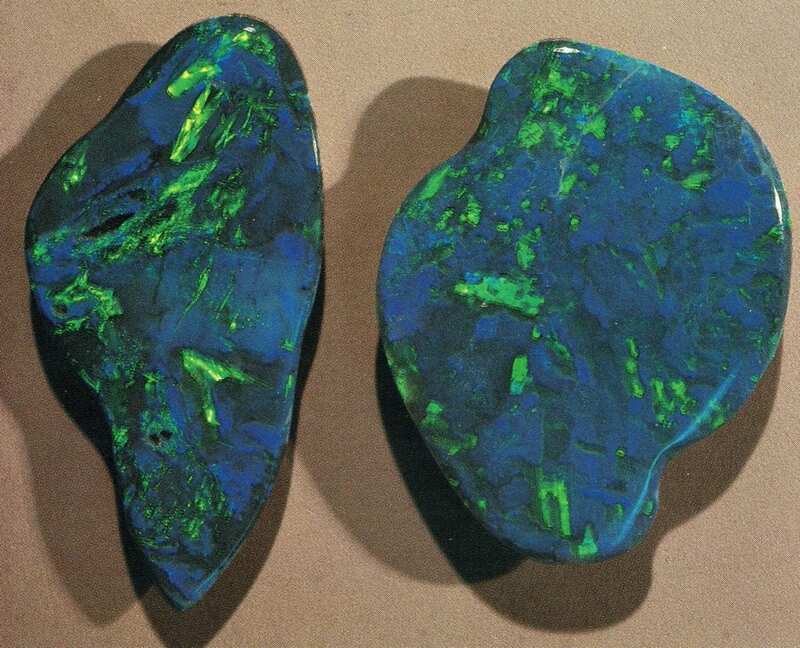 These opals get their blue color from finely disseminated inclusions of chrysocolla, a copper phyllosilicate mineral. Sometimes refers to brown, common opals. Yellowish brown common opals with a waxy to resinous luster. Resin opal. Photo by Aisha Brown. Licensed under CC By-SA 2.0. Red to yellow common opals. Composed of quartz, opal, and pyrite, these gems occur in the state of Louisiana. These opals have small black or brown spherical inclusions resembling fish roe and an over play of color. Yellowish opals with a waxy luster. 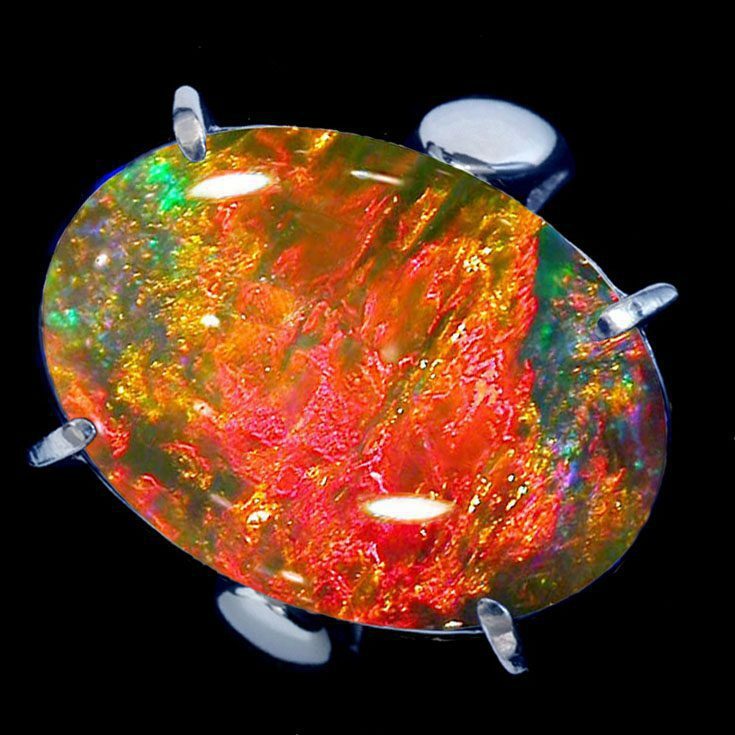 Extremely rare, the asterism or star effect these opals display is caused by imperfections in the arrangement of their silicate spheres. 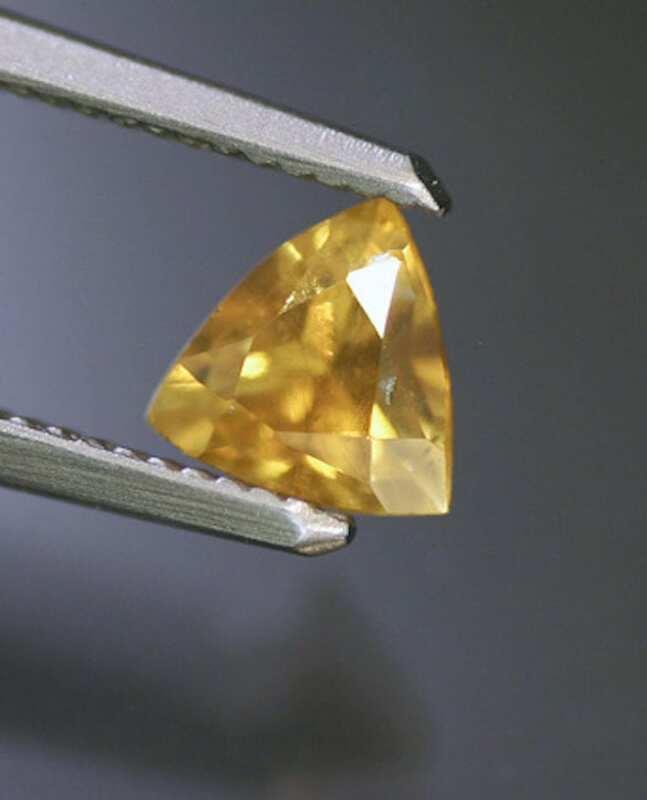 Thus, their star effect differs from that of other gems such as sapphires, caused by inclusions. 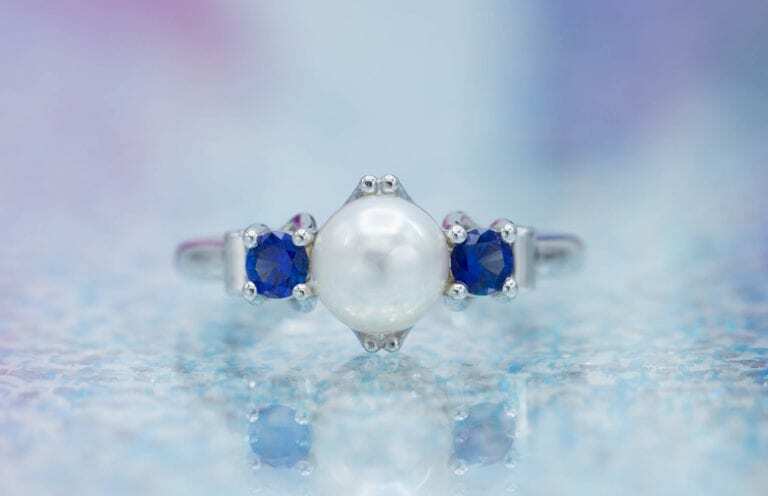 The term “opalite” usually refers to a plastic or glass opal simulant. 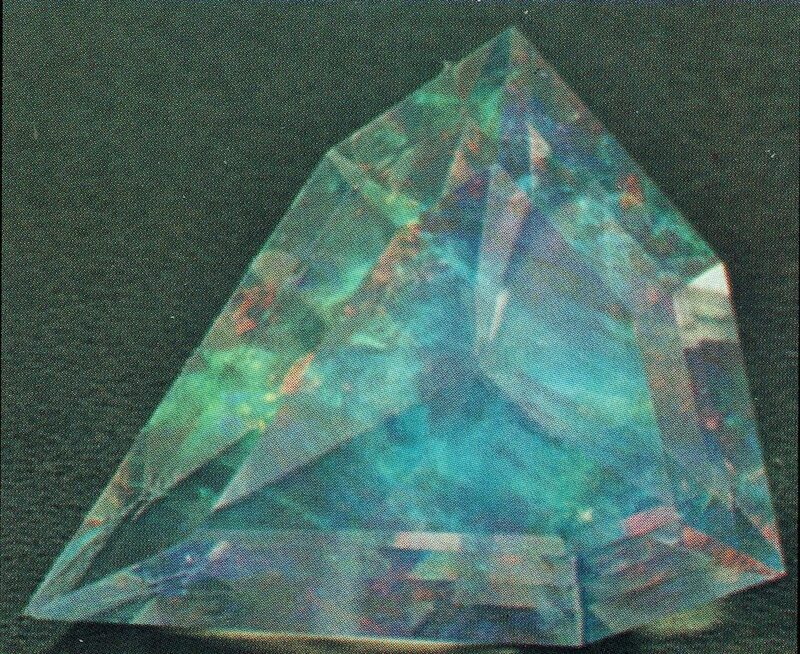 However, there is a variety of natural opal sometimes called opalite. This common variety of opal comes in green, lavender, or purple colors and can also show a cat’s eye. To avoid confusion, don’t refer to this opal variety as “opalite,” due to the name’s strong association with simulants. White Cliffs, Australia: medium blue (LW); may phosphoresce in LW. Park, Wyoming: dull white (SW), strong white (LW); may phosphoresce in both SW and LW. Queretaro, Mexico: dull white (SW), bright blue (LW); may phosphoresce in both SW and LW. Virgin Valley, Nevada: bright green (SW), medium green, blue-white (LW); may phosphoresce in LW. Quartzite, Arizona: pale yellow (SW), bright pale yellow (LW); no phosphorescence. Opal may also fluoresce brownish. Black opal is generally inert. Fire opal luminesces greenish brown. 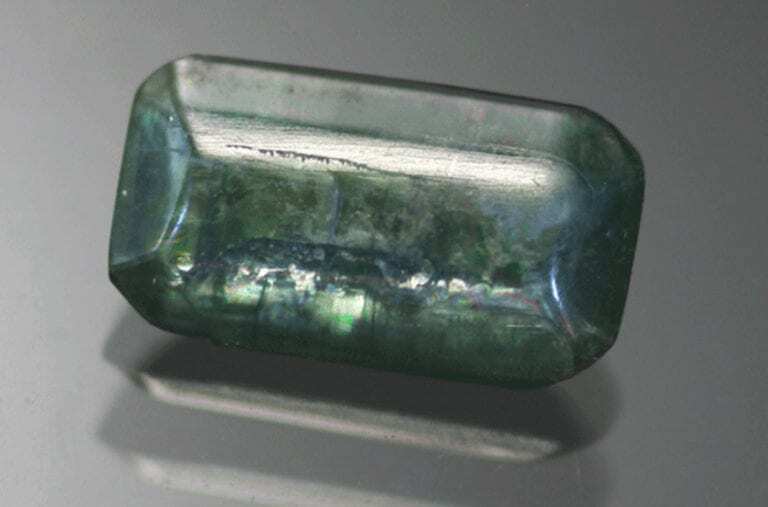 Common opal often fluoresces green. 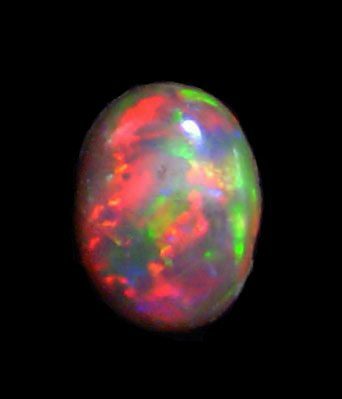 Natural opals may also have phosphorescence. Chinese writing resembles Asian script. Usually in gold and green, somewhat rare. Fern leaf lacy patterns resemble a fern leaf. Mostly in larger green gems, rarely red. Flagstone features large, broad patches of color, set close together. Much like harlequin, only with larger patterns. Rare and highly valued. Flame opal, bands or streaks of red fire that move across the surface. Floral, a variety of repeated designs and colors, reminiscent of floral dress material. Harlequin or mosaic, close-set broad patches with angular play of color. Highly desirable, adds considerable value. Palette has a variety of colors, resembling an artist’s paint palette. Peacock opal, predominantly green and blue play of color, with some resemblance to a peacock tail. Pinfire or pinpoint, very small areas of fire set close together. Common and one of the less valuable patterns. Rolling fire, a rare phenomenon where the fire moves across the surface rather than flashing on and off. Ribbon, slightly curved, parallel bands of color. Usually parallel and on black or dark base. Rare. Straw resembles flattened straws, crisscrossing each other. Rare. Windmill, a pattern of fire that radiates around a central point. Very rare. Chaff, thin, linear bands of color. Flash opal, a play of color that quickly flashes off and on as the stone is moved. These stones have alternating layers of precious and common opal. In chatoyant or cat’s eye opal, the color play is concentrated in the form of an eye or band. Matrix opal consists of specks of precious opal in a rock matrix, usually sandstone. This type of opal is often dyed black to enhance the color play. 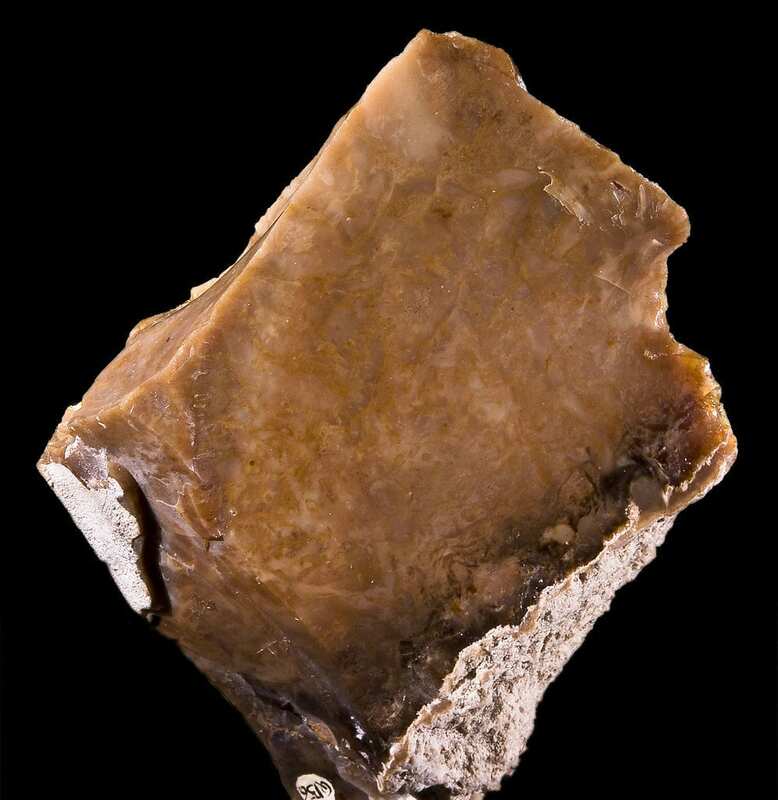 Ironstone opal forms in a hard, brown, compact type of sandstone. Matrix opal may also consist of layers or stringers of opal in a rock matrix. Also called mass opal. Also gold opal (gold fire), blue opal (bluish fire), lechosos opal (green colors). Gold opal. Photo by Aisha Brown. Licensed under CC By-SA 2.0. Synthetic opals may show a strong display of color, usually in a mosaic pattern. With high magnification and top or backlighting, you can find a cellular, scale-like, snake skin, or chicken wire structure in the pattern. Under high magnification with transmitted light, synthetics may show a dendritic structure. Opal gems synthesized through a process created by Pierre Gilson appear very natural. Gilson opals: cabochons from 3 to 6 cts. Photo © Joel E. Arem, PhD, FGA. Used with permission. 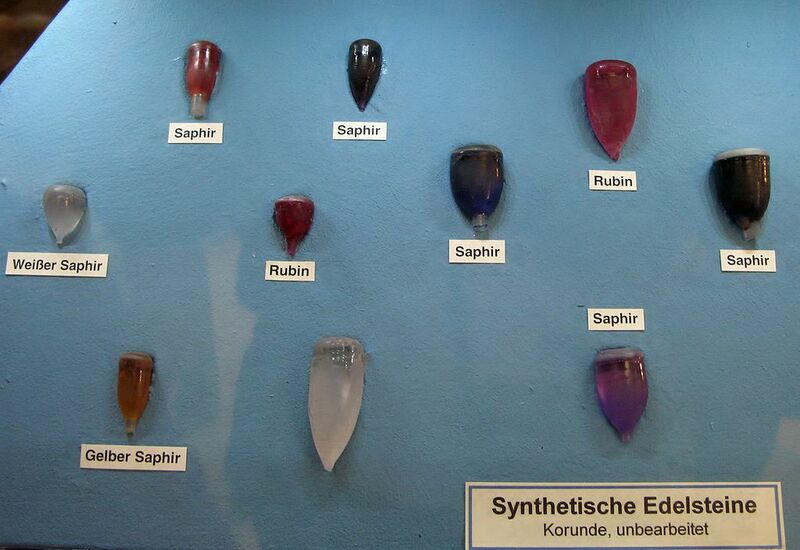 Synthetic opals don’t phosphoresce. They may also stick to the tongue. 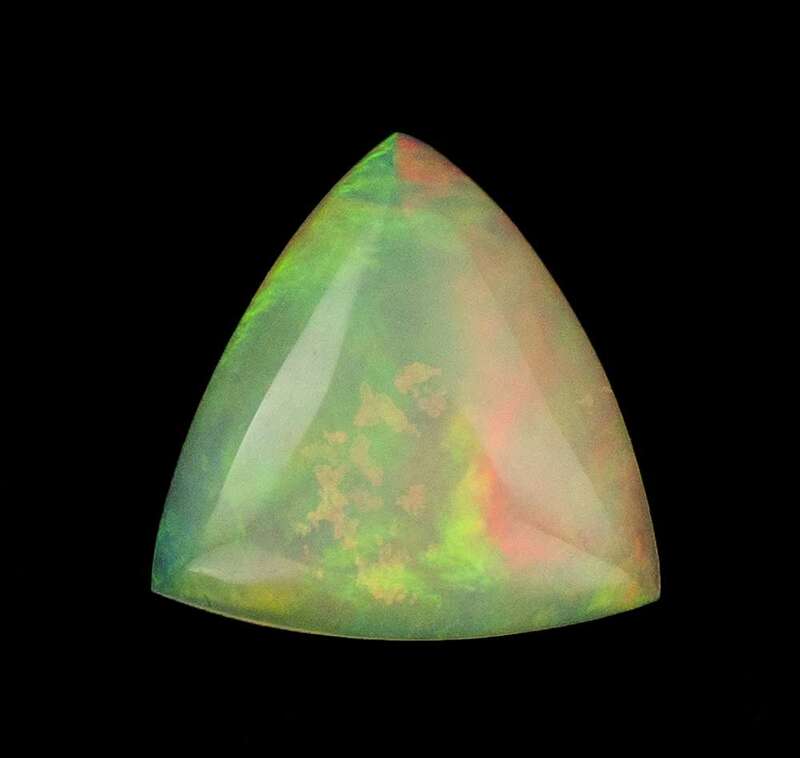 Synthetic white opal can show columnar structures from the side. Synthetic opal. Photo by Christian Schröder. Licensed under CC By-SA 3.0. Plastic imitations or simulants are soft and can be probed with a sharp needle. They don’t phosphoresce. Glass simulants typically contain glass bubbles and swirl marks. They also don’t phosphoresce. Their specific gravity (SG) and refractive index (RI) are usually higher than natural opal. Improves play of color, disguises crazing. Common. Stability poor for oil and wax. Detectable with a hot point test. Plastic usually requires major lab equipment. Gives appearance of black opal, disguises crazing. Stability excellent. Somewhat common. Detectable because the treated pieces have too low SG values and the concentration of color in cracks. May require major lab equipment. Darkens body color. Common. Stability, fair to poor. Detectable through magnification and low SG (may float in water until it absorbs enough to sink). Loses play of color when wet but returns when dry. Unusually low RI, 1.38 to 1.39. Darkens body color. Common. Stability good. Magnification shows black concentrations. Hydrophane opals will absorb water and chemicals, which can have a negative effect on their appearance. Keep them dry and away from all sources of contamination. Australia is the best known opal-producing area in the world. However, the deposits have been worked so intensely that they’re becoming depleted. Fewer miners are now working the opal fields compared to 10 years ago, and new discoveries are rare. These factors, plus worldwide demand, place tremendous pressure on opal prices. The first discoveries of the modern Australian opal trade probably occurred around 1850, but Queensland yielded major finds around 1872. 1.47-ct Barion emerald-cut opal, Lambina Mines, Australia. © Dan Stair Custom Gemstones. Used with permission. Boulder opal: shells of coarse, hardened, sandy clay with layers of opal in between. Yowah nuts: walnut-sized concretions, in a regular layer, like a conglomerate. The opal is the central kernel and never reaches the outer edge. Seam opal: thin to thick seams of white or black opal in sandstone matrix. 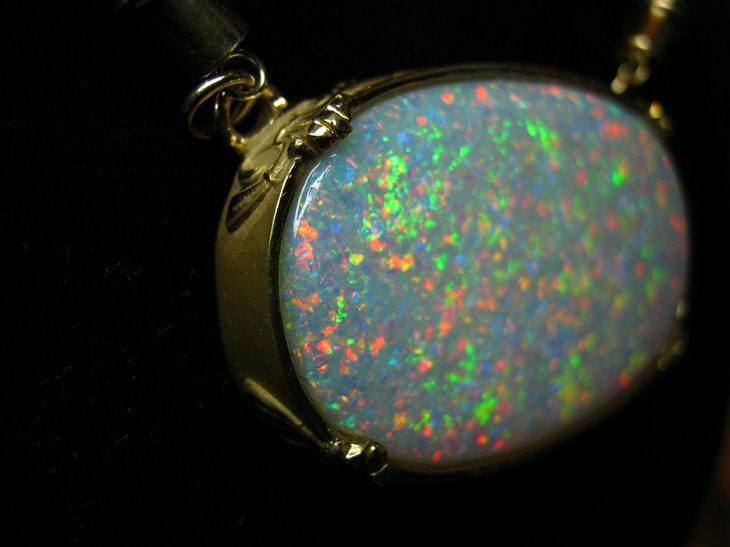 Also known as sandstone opal. Large stones are very rare in this material. 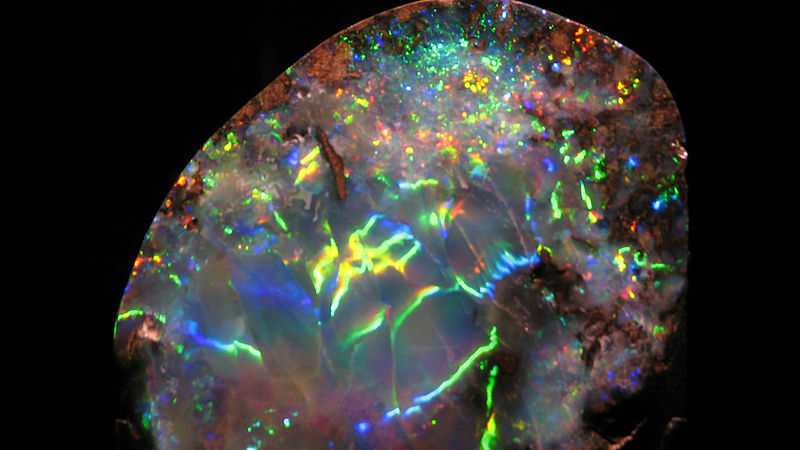 Lightning Ridge: black opal in nodules, world’s finest of this material; first mined commercially about 1905. Grawin Opal Field, about 25 miles SW of Lightning Ridge, produces light-colored seam opals. Coober Pedy, South Australia: modern mining began here about 1915; only white opals found here, in sandstone and claystone matrix, but some very fine. 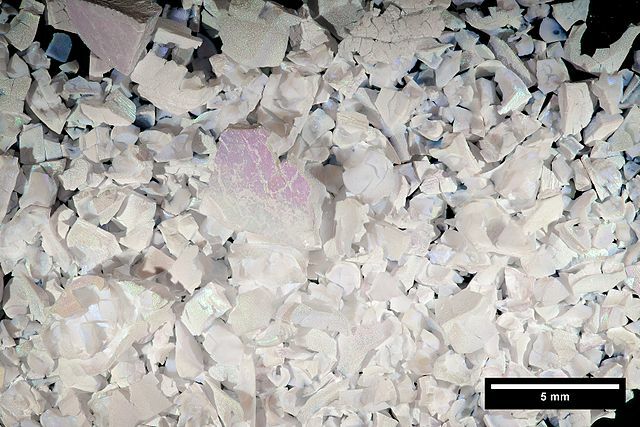 Andamooka, South Australia: opals found here about 1930; very distinctive opal, white and also brownish in color; may be artificially blackened to enhance the appearance of the fire in the matrix. White Cliffs area: started about 1889, but the opal is usually small, with veinlets of precious opal within common opal. Gabanintha (Murchison Goldfield): bright green opal, colored by copper, found in quartz. Mintabie: mined since 1931, about 350 km northwest of Coober Pedy. This area has now been extensively prospected. Black opal: Australia (freeform cabochons approximately 30 cts each). Photo © Joel E. Arem, PhD, FGA. Used with permission. Opal occurs in sandstone in Piaui Slate, northern Brazil, and also near Manaus, northern Brazil. The material is white and fiery and sometimes resembles good-quality Australian white opal. It ranks perhaps as the most durable opal, low in water and not heat sensitive. Dr. Joel Arem reports seeing a cut gem held for 30 seconds over a candle flame with no adverse effects. The material seems to be abundant and much of it is shipped to Hong Kong where it’s cut and sold, often as Australian opal. 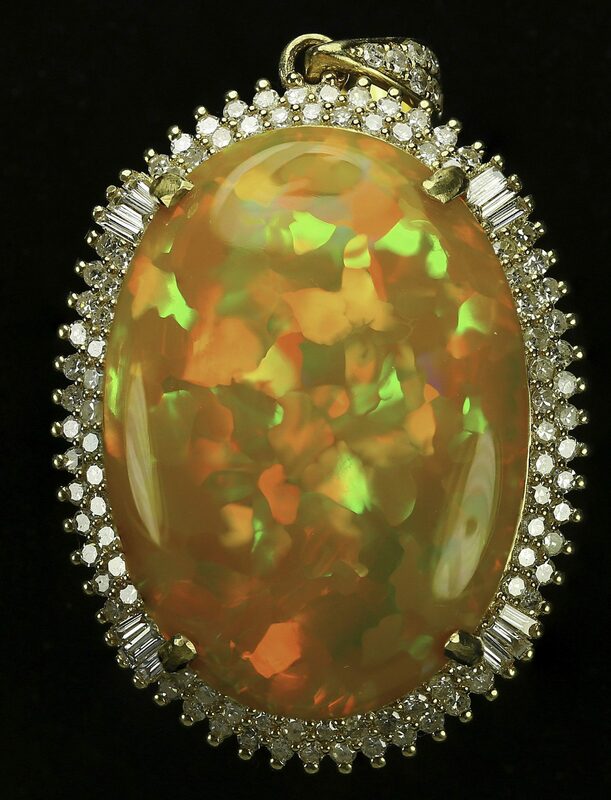 8.62-ct Brazilian yellow opal, 18 x 12.5 mm, oval buff top cut. © The Gem Trader. Used with permission. A source known in Ancient Roman times, near the village of Czerwenitza (formerly in Hungary), produces opal as seams in grayish brown andesite rock. This opal has a mosaic of strong colors and appears very attractive against a milky white background color. Much of this is harlequin-patterned opal. Precious opal from the Slovak Republic, Slanské hills, village Červenica site – Libanka. Photo by Ivan Kopor. Licensed under CC By-SA 3.0. An ancient source of opals, Ethiopia has also had recent discoveries of precious opal in 1994 and 2008. 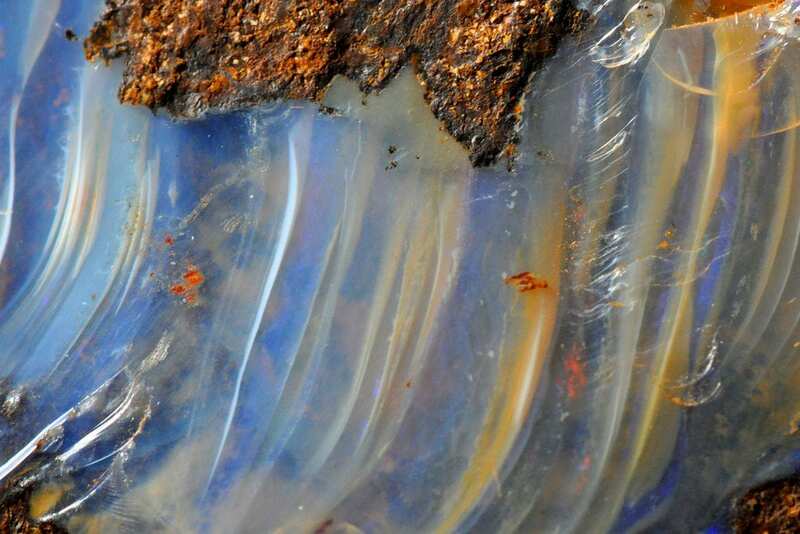 The opal found near the town of Wegel Tena displays a remarkable play of color. Diamond and gold pendant with 19.9-ct Ethiopian Welo opal. Photo by Dpulitzer. Licensed under CC By-SA 4.0. Deposits known since before 1843, perhaps much older than that. Occurs as veins in dark reddish to black trachyte rock. 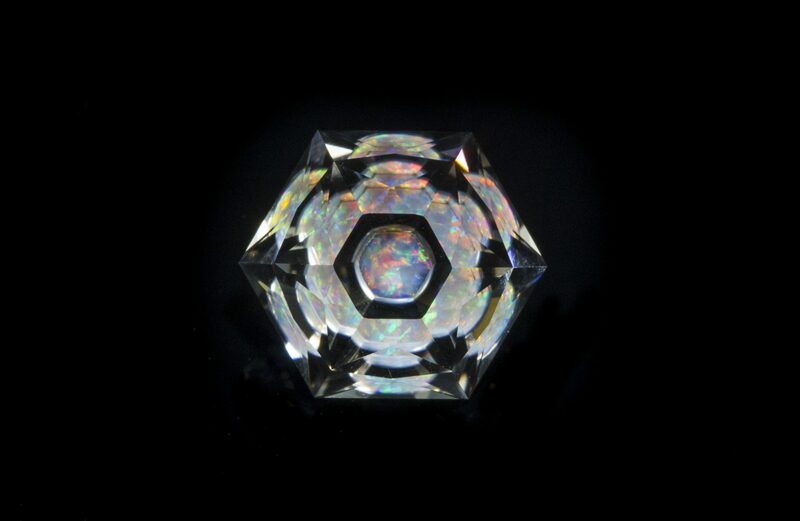 White opal contrasts strongly with the dark-colored matrix. Pieces not large, seldom very spectacular. Very little known material, as thin seams in dark rock. Much of it is water opal and resembles material from Mexico. The white opal resembles poor-grade Australian. Indonesia produces some very unusual black opal that consists of reddish flecks of color swimming in a translucent but very dark brown body. Most gems are very small (less than 10 carats) from this locality, and production is very small. Black opal, Indonesia. Photo by Dharma Mulia. Public Domain. Mexican opal occurs in siliceous volcanic lavas, in cavities, and in many localities. 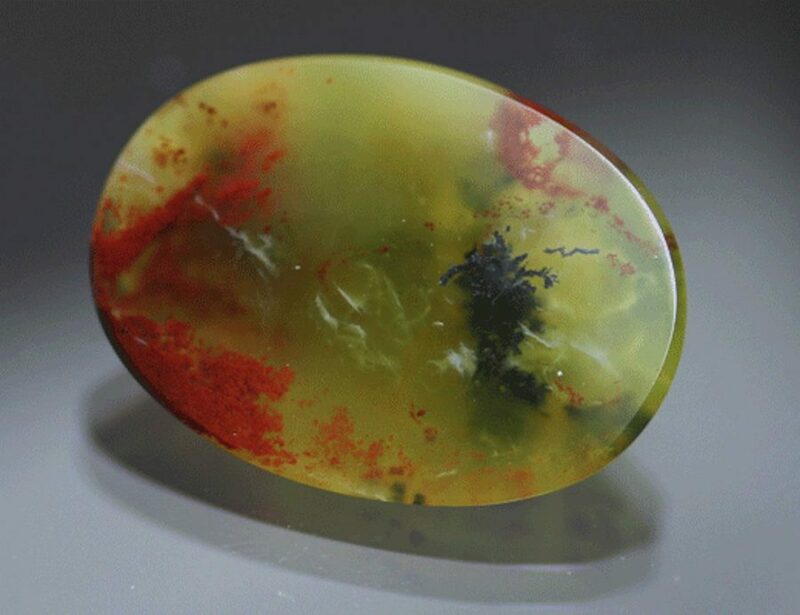 Yellow and red fire opal comes from a trachyte porphyry at Zimapan in Hidalgo. Hyalite and precious opal that is completely transparent, colorless, and rich in fire occurs at San Luis Potosi. Queretaro is also a well-known opal-producing locality. Fine Mexican opal is very rare in large sizes (over 50 carats) but is among the most beautiful. Fire opal, 6.3 x 5.9 x 3.3 cm, Chihuahua, Mexico. © Rob Lavinsky, www.iRocks.com. Used with permission. Green prase opal, colored by nickel. 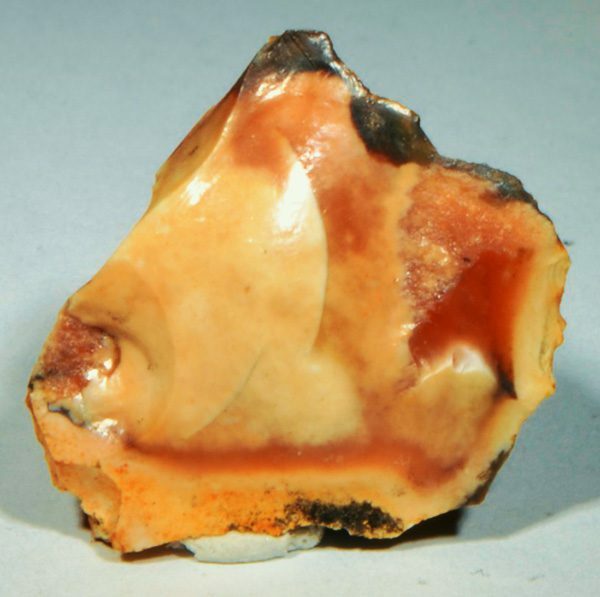 Nickeliferous opal resembling chrysoprase occurs in Tanzania, associated with brown limonite. 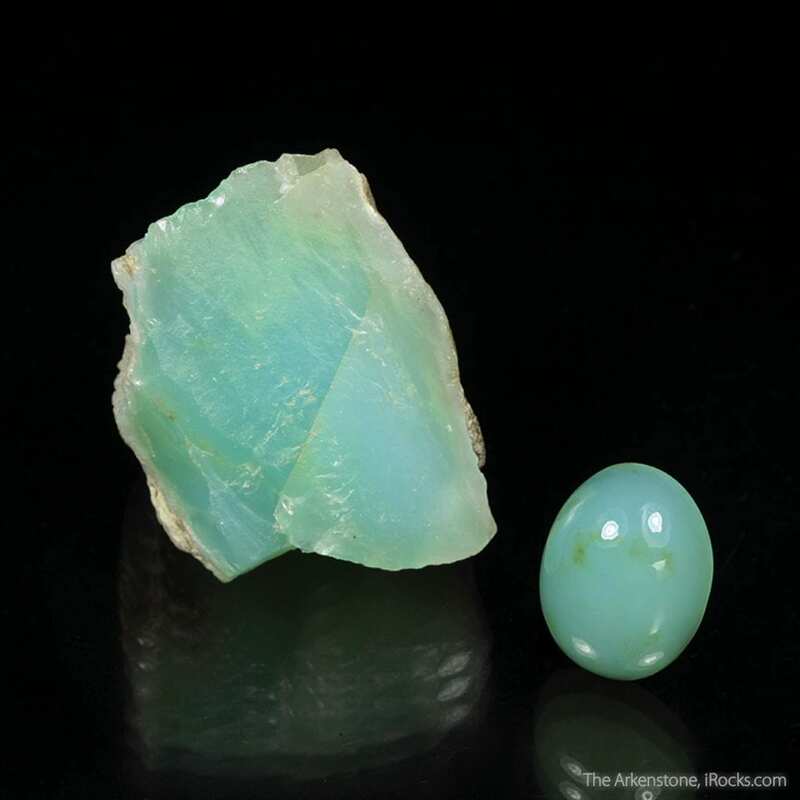 The RI (1.452) is lower than that of chrysoprase (1.535), as is the gravity (2.125 versus 2.620). Stone sizes tend to be small. Discovered around 1900 in Virgin Valley, Humboldt County, Nevada, opal occurs here as cracks and seams in opalized wood. 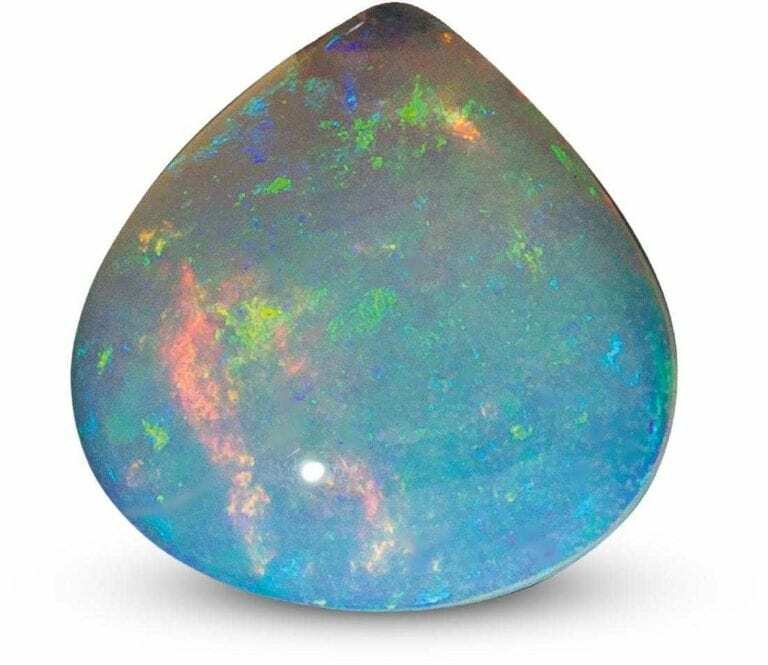 Magnificent but very hydrous, this opal has a strong tendency to crack due to loss of water when exposed to the air. Whole skeletons of extinct animals have been replaced by fine precious opal at this locality. Similar opal occurs in Idaho. Spencer, Idaho has produced star opals. Other opal sources in the United States include Arizona, Louisiana, Oregon, and Wyoming. 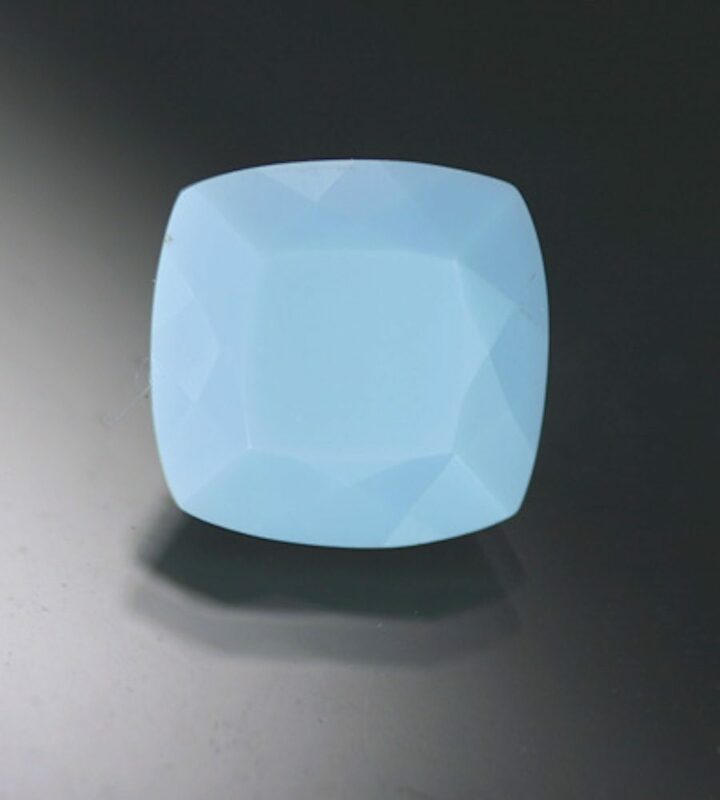 Blue opal, 4.30 cts, Oregon, cushion cut, 10.8 x 11.2 mm. © The Gem Trader. Used with permission. Bolivia; Canada; China; Myanmar; Namibia; Peru. Opal rough and cut set, 3.2 x 3.2 x 2.8 cm (crystal), 12.71 cts (cabochon), Acari Mine, Caraveli Province, Arequipa Department, Peru. © Rob Lavinsky, www.iRocks.com. Used with permission. Olympic Australis: Coober Pedy; uncut was 127 oz. Noolinga Nera: Andamooka; 86 oz rough, 205-ct oval cut. Roebling Opal: Nevada (Rainbow Ridge); 2,610 cts (in the Smithsonian Institution). Light of the World: Lightning Ridge, Australia; 252, partly cut. Red Admiral or Butterfly: Lightning Ridge, Australia; 40-50 cts rough. Many regard this as the world’s most beautiful opal. Pride of Australia: Lightning Ridge, Australia; 226, partly cut. Pandora: Lightning Ridge, Australia; 711, cut. Smithsonian Institution (Washington, DC): Australian gems; 345, 155, 83 (all white); black opals of 58.8, 54.3, 44. Also 355 (black, Nevada); 143.2 (orange, precious, Mexico); 55.9 (colorless, precious, Mexico); 39 (pale yellow-orange, precious, Brazil). Opals are delicate but well worth the extra care. They have a great sensitivity to changes in temperature as well as a “crazing” tendency, which means they can easily develop cracks or “craze” as they dehydrate. (Cracks on the surface are called “checking”). Opals kept in water must be dried carefully before cutting. Sometimes opals in rings can become chalk white and lifeless. This may be due to a network of scratches on the opal surface that destroys the polish and dulls the color play, but a simple re-polishing can usually correct this. 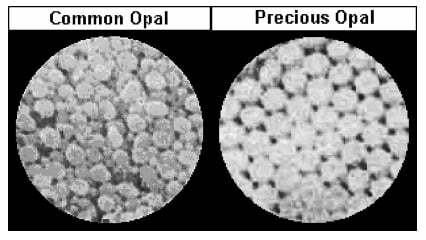 Be advised that opals can be shattered or damaged beyond repair much more easily than other popular gemstones. They have a hardness of only 5.5, which makes them very susceptible to scratching. Opals aren’t recommended for ring stones, unless the stone is placed in a protective setting or a triplet or reserved for occasional wear. Consult our care guide for opals for cleaning, setting, and storage recommendations. Peter Brusaschi explains how he felt when he first discovered the opal town of Yowah in the outback opal fields of Australia.